Americas Best Value Inn Gettysburg offers the most value for your money when staying for business- pleasure- or just passing through. We are an AAA 2-Diamond hotel with clean spacious rooms- complimentary continental breakfast- complimentary coffee in our lobby- and free Wi-Fi in guest rooms and public areas. Guests can also enjoy our indoor jacuzzi and seasonal outdoor pool. All guest rooms include hairdryers- iron- ironing board- satellite TV channels- and ESPN. Some rooms include a microwave and mini-fridge. Take advantage of our extremely comfortable beds and relax while saving money year-round with our Kids Stay Free Policy *17 and under in parent*s room*. For those guests that are in town on longer term corporate assignments or business trips we also offer special weekly and monthly rates- as well as direct billing options. For your convenience our hotel is 100 percent smoke free. Pets are welcome- restrictions apply. We are centrally located less than 1 mile from the Gettysburg Battlefield- the Appalachian Brewing Company- and Gettysburg College. 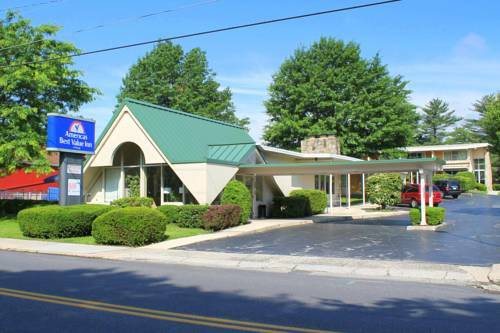 Americas Best Value Inn Gettysburg is your best choice within Southeast Pennsylvania. We offer ideal accommodations and location whether you are in town for historic sightseeing or simply passing through on your way to Philadelphia. At Americas Best Value Inn Gettysburg our goal is to provide our guests a great experience- not just a place to stay. At Americas Best Value Inn Gettysburg- We*ve Got You Covered from the time you hit the road until your head hits the pillow. Dobbin House Tavern: 0.3 mi. O*Rorke*s Eatery and Spirits: 0.3 mi. Garryowen Irish Pub: 1 mi. General Pickett*s Buffet: 0.2 mi. Americas Best Value Inn Gettysburg is located on U.S. Business Route 15 in Gettysburg just 1 mile south of intersection at US Route 30. Our address is 301 Steinwehr Avenue/ Gettysburg/ Pennsylvania 17325.